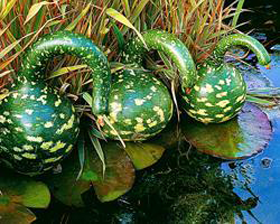 A highly attractive ornamental gourd, the long neck of which curves elegantly downward resembling a Swan's head. The body of the fruit grows about 20 cm in diameter and has a near flat bottom. Deep green in colour the fruits are speckled with beautiful creamy markings. Harvested and left to dry. Also you can paint them. Please note the fruits of these are not edible. Sow March to April. Sow seed 12mm deep, in pots of moist seed compost. Place in a propagator or warm place, and keep at a constant temperature of between 20-25C. Germination will usually take 7-21 days. Can also be sown direct outdoors once the soil has warmed.